Until recently, capable security cameras that cost less than a hundred bucks have been few and far between. 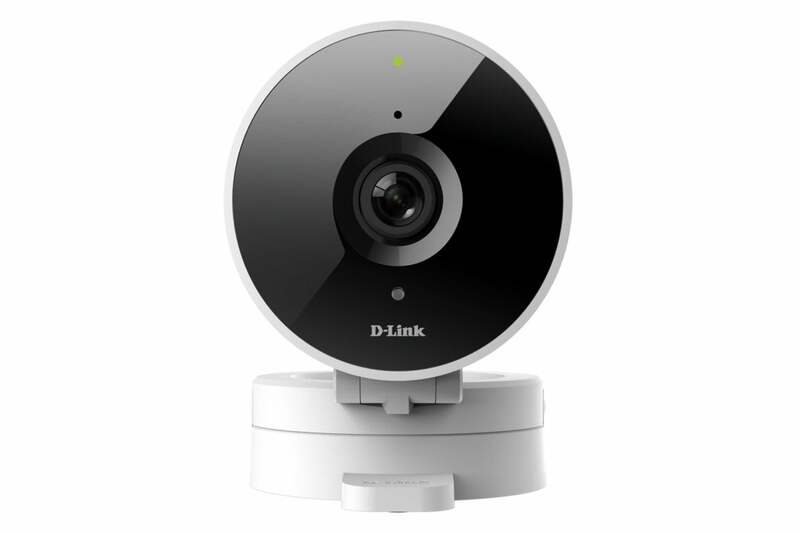 D-Link plunges into this growing pool with its entry-level HD Wi-Fi Camera (model DCS-8010LH). Stocked with essential features and retailing for just $60, it’s an attractive option for home-security beginners, but the complexity of the newly redesigned MyDLink Home companion app might be more than they bargain for. But first, the camera. The DCS-8010LH pairs a small footprint—it’ll fit in the palm of your hand—with a utilitarian design that makes it fairly unobtrusive in any room. The camera body attaches via a hinge to a donut-style stand that you can set on a shelf or tabletop. A simple mounting kit is included if you’d rather attach it to a wall or ceiling. The hinge gives you several degrees of tilt for fine-tuning the viewing angle, but the 120-degree lens will give you wall-to-wall coverage in most rooms without too much fuss. Despite its entry-level price, the DCS-8010LH doesn’t sacrifice much in the way of features. In addition to the wide-angle lens, you get 720p video; customizable motion and audio detection; 16-feet of night vision; and integration with Google Assistant, Amazon Alexa, and IFTTT. The HD Wi-Fi Camera's 120-degree lens provides wall-to-wall coverage of most rooms. This camera also comes with the option to record locally or to the cloud—the former stores videos on a microSD card (not included), while the latter comes with free and paid subscription options. Out of the box, you get a rolling 24 hours of free storage for up to three cameras. You can upgrade to one of three paid plans: Basic bumps it up to seven days of storage for three cameras for $2.50 per month ($25 per year if paid annually); Premium gives you 14 days of storage for up to five cameras for $5 per month/$50 per year; and Pro provides 30 days of storage for up to 10 cameras for $10 per month/$100 per year. Befitting a camera targeting first-time users, the DCS-8010LH is pretty easy to get up and running. Plug in the Micro-USB power cord and download the MyDlink Home app for Android or iOS, which will prompt you to scan the QR code on the back of the camera and get you connected to your Wi-Fi network. When you launch the MyDlink Home app, you’ll see a widget displaying the connected camera’s live feed. Ostensibly, this is for quick live look-ins; to actually control the camera you must tap on this display to open the camera’s home screen. You have to create custom automations to record video and push alerts when motion or sound is detected. The live feed is displayed here again, and beneath it is a spartan set of camera controls—buttons for taking a screenshot of the feed and manually recording video, and there's a grid icon that opens options for toggling the resolution from 720p to 480p and muting/unmuting the onboard speaker. The DCS-8010LH provided a complete view of my living room in sharp detail. You can pinch to zoom in on areas, though the picture gets increasingly pixelated the more you do. Night vision did a good job of illuminating the darkened room without leaving any blind spots. After about an hour of running the camera, though, I realized I wasn’t getting any motion alerts, even though I had turned motion detection on in the app settings. 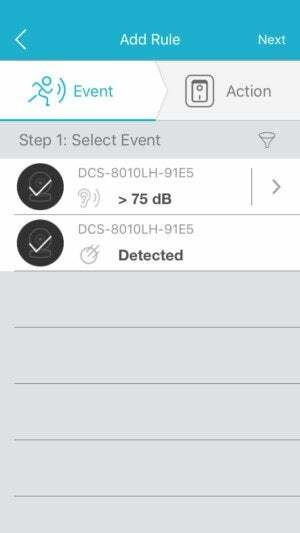 A quick call to D-Link uncovered the reason why: Unlike most security cameras, which enable motion detection with the flip of a toggle—if it’s not already enabled by default—the DCS-8010LH requires you to create an if-this-then-that-style automation. In addition to turning on motion detection under Device settings, I had to go to the Account menu and turn on Notifications. I then had to go to the Automation menu and create a “rule” by selecting a triggering event. In this case, I selected both motion and audio detection as triggers—and then chose actions to be performed. I selected "record video" and "push notification" and saved the automation. Finally, I had to return to the automation menu and turn the automation on to activate it. At first it seems kind of convoluted, but once you play around with it a bit you can see the high degree of customization if provides. An automation can have a single rule or multiple ones for more complex tasks. And you can create multiple automations to give you the flexibility to turn on just the camera you need when you need it. The redesigned MyDlink Home app's multitude of menus can be daunting to navigate. But it is in no way intuitive. 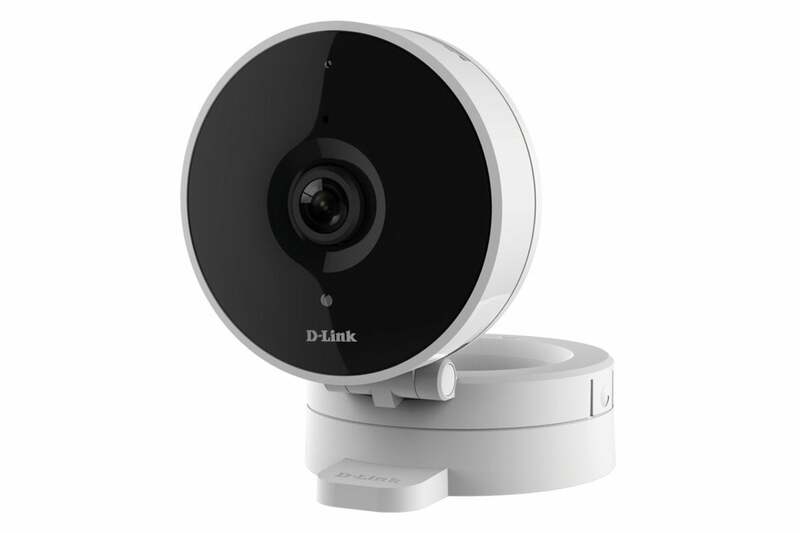 I struggled to figure this system out as a seasoned security camera user, so it’s easy to imagine this going right over the head of the newbie D-Link is marketing the DCS-8010LH to. For what it’s worth, I later found this video tutorial for creating automations. D-Link would be smart to integrate that or a similar tutorial into the MyDlink Home app. With that figured out, I started receiving motion and audio alerts. You can customize motion detection for better accuracy and frequency by adjusting the sensitivity level and using the motion zone feature, which lets you mask in only areas you want to monitor—doors and windows, for example. 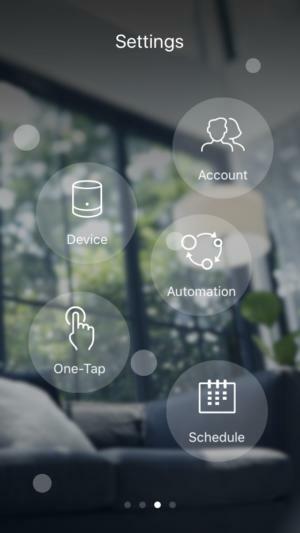 You can also schedule your automations to activate only at designated times or turn off monitoring altogether by turning on a privacy setting. Event-detected videos are stored in a timeline you can access from the camera’s home screen. You can filter these by event type or by camera or location if you have multiple cameras connected. The DCS-8010LH delivers a lot of bang for your 60 bucks in terms of features, but mastering it will test the mettle of most first-time security camera users. Smart home nerds will applaud the breadth of customization the MyDlink Home app offers, but simplicity is what security novices seek. In addition to the issues already mentioned, the app—though having an attractive new bubble-menu design—just feels daunting with screen after screen of menus and functions, and I often found it hard to get where I wanted to go and to find my way back. If you’re already invested in the D-Link smart home ecosystem and want to add a security camera, the DCS-8010LH is a good place to start. But if you just want to see what the DIY security scene is all about, the Xiaomi Mi Home Security Camera offers some upgraded specs at a lower price with a shorter learning curve. D-Link's DCS-8010LH is an affordable option for smart home enthusiasts, but it might be too complicated for those who just want a simple entry-level security camera.